delivers 1 unit about every 3 days. delivers about 1 unit per day. If you’ve been selling 10 units a month for 5 years, you have 600 customers, who’ll buy a vehicle every 3 or 4 years. Closing ratios with repeat customers and referrals are 75% to 100%, your commissions are 40% higher, CSI is max, and there’s zero grief. That’s more than enough customers for you to deliver an easy 30 units per month or more, and earn $100,000-$150,000+ every year. Can you imagine the fun you’d have every day, if you were making 80% of your sales to people you’d sold a car to in the past? Whatever you dislike about selling cars is because you sell to price-focused, ad-driven, walk-in customers. Get serious in 2018 and build your business. 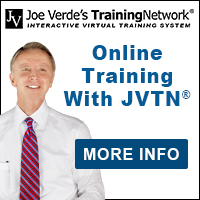 Get to our “How To Sell A Car” and our “Phone / Business Development” workshops, and stop watching videos on JVTN® and start spending at least 30 days on each course so you can actually develop your skills and your processes. Next year is almost here – start planning now! 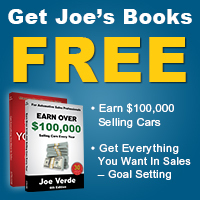 Get Joe Verde’s sales book, Get Everything You Want In Sales, now and put your career on the right track – it’s free.